Rosekitty, we would be thrilled to have you join us in our next contest but this one is already over with. Keep your eyes out for the next one! just hope i can get a good result. You are the winner of the DD5 contest!!!! Today is the last day to post scores for the DD5 game. Hope you all had fun with this game!!!! I hope everyone had fun with this game. But time is winding down for this contest and we will be moving on to another. So don't forget to post scores so that we can get those badges out. In case any one needs them. Here are the instructions to capturing a screenshot that was given to me. Im posting this because some may not know how to do it, I know I didn't. But found that it was easy to do. Hold the ALT key down and, while doing so, depress your PRINT SCREEN button. This will capture the image on your screen. Now, Open the Program "Paint" on your computer. It will open with a blank white box in the top left. Click in the white box and then depress and hold down the CTRL key, while at the same time depressing the V key on your keyboard (letter "V"). This should paste the image into the box which will then fill the Paint screen. Save the file from your File drop down menu--select Save, name it what you want in the box with the blue highlight -- just backspace on blue highlight and insert your name, then save to your Desktop or a folder on your computer (it will save as a .jpg). Now when you are ready to post the screenshot here, hit Post Reply-Select the host an image box above and then browse your pictures, click on the medal image and then select the click Upload. Once you have done that you copy and past the html link in the image box next to the host an image box above, and Voila there you have it. Your medals!!! The same way we post all of our images. If you have any problems let us now. BONUS LEVEL SCORES DO NOT MAKE YOUR OVERALL HIGH SORES INCREASE. I GUESS THAT IS WHY THEY ARE CALLED BONUS LEVELS. GO FIGURE. To make it more fun and interesting to see who is where in the game, post your scores as you complete your levels. You can repeat levels to increase your scores as much as you would like to. Im going to use the table below to keep track of mine. Remember for those who have already started to play this game, you MUST start a new game. The contest starts tomorow 3-11-10 and ends on 3-22-10. 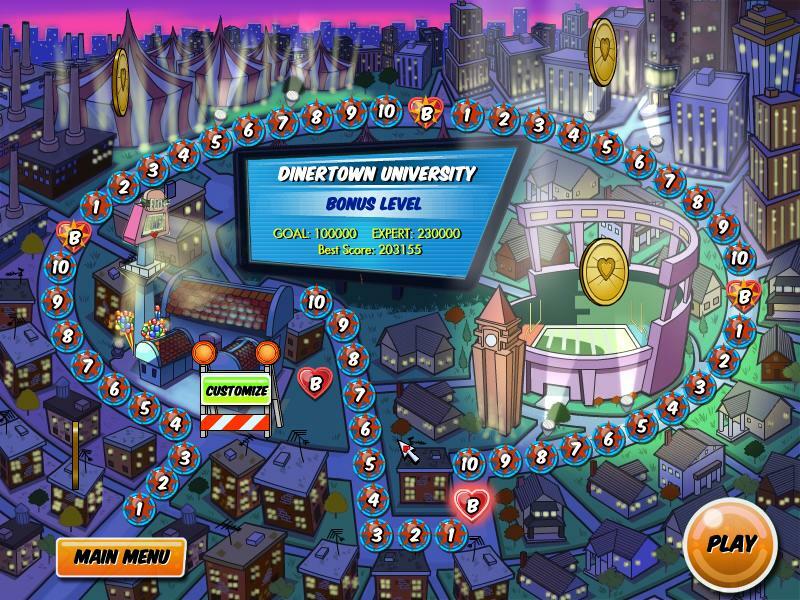 Here is what your screenshot should look like for First To Finish and expert on Dinertown University. As you can see I did not make expert on Dinertown University Bonus level. It's a very hard level. (lol) Please be kind to one another and give tips when asked or maybe just to help each other out. This is a fun event and we want to keep it that way. So lets have some fun ladies and gents!!!! Ready Set Serve!!!!! Subject: Re: Ready Set Serve!!! !